Ever wondered how to make kombucha, or fermented tea, at home? 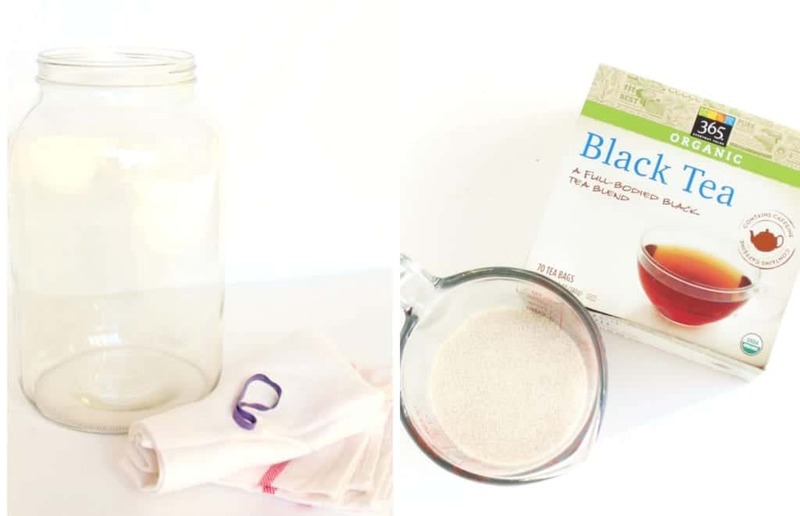 This guide shares just how easy it is to make this fizzy beverage in your own kitchen! Lately, I feel like it’s pretty trendy…at least in the crowd I hang around with. I remember the first time I tried this fermented tea beverage, and I did not like it. I tried desperately to sip it down, but it tasted so vinegary. Well, I’m not quite sure when it happened, but sometime in the past 3 years I decided to give kombucha another try and I LOVED it! Strange, right? Now, I find the fizzy drink super refreshing. One bottle of kombucha can be pretty pricey (some are around $5! ), and I had heard that the drink could be brewed at home. My friend actually made a SCOBY, the symbiotic culture of bacteria and yeast that ferments the sweet tea, and he offered some of it to me. I was happy to take the SCOBY off his hands, and I’ve been brewing my own ‘booch for the past few months! 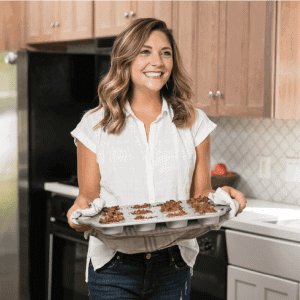 I initially followed this tutorial from The Kitchn, but since then I have spoken with friends, other bloggers, and picked up a few of my own tricks along the way. Kombucha, pronounced “kahm-booch-uh”, is sweet black or green tea that is fermented with a SCOBY. The bacteria and yeast in the SCOBY “eat” the sugar to create a fermented, subtly sour, lower calorie, lower sugar, fizzy drink. This is my SCOBY in reserved fermented tea. Kombucha is chock-full of probiotics, antioxidants from the tea, and acetic acid from the fermentation process. While many individuals claim personally experience of health benefits such as improved digestion, better sleep, and weight management, but many of these claims are not scientifically proven. That doesn’t mean there are not benefits to consuming kombucha, it just means that the studies have not yet been conducted. Unfortunately, nutrition studies are very expensive to conduct and there are often many confounding variables weakening the research. Hopefully, more human research on the health benefits of kombucha is completed soon! Probiotics are the good bacteria inside your digestive system. These bacteria help keep your body healthy and are naturally found in your body, fermented foods, and supplements. Currently, there are studies showing that probiotics help with digestive health (including IBS, and IBD). They may also aid in skin health, preventing colds and allergies, and oral health but further research is needed in these areas. Probiotics are generally safe for most people, but if you have a specific condition or experience any side effects I would recommend speaking with your health professional. There is a small amount if alcohol in alcohol created during the fermentation process. Typically, there is no more than 1% alcohol, so if you are drinking a typical 8oz serving you should be fine. I think this is important to note if you are avoiding alcohol for any reason so you can make the choice as to whether or not you want to consume. FODMAP Friendly recently announced that kombucha is NOT low FODMAP. FODMAP thresholds are unique to individuals, so it’s important to pay attention to how you feel after consuming kombucha. Make the sweet tea. Bring the 3 1/2 quarts of water to boil in a large stock pot. Remove from the heat and stir in the cup of sugar until it is dissolved. Then, add the 8 tea bags. Allow the tea to steep until it is completely cool. This will take a few hours. Add the starter tea and SCOBY. Once the tea is cool, remove the tea bags and pour the sweet tea into the gallon glass jar. Next, add the starter tea and the SCOBY. Cover the mouth of the jar with a clean kitchen towel or wash cloth and secure with a large rubber band. Allow the tea to ferment for 7-10 days. During this process, you will want to keep your kombucha in a space that is room temperature and out of direct sunlight. Try not to jostle the mixture around. Check the flavor of the kombucha periodically during the fermentation period. The SCOBY may float at the top or sideways in the tea. A new SCOBY will begin to form and will probably be attached to the old SCOBY. Noticing sediment at the bottom of the jar, strings, and bubbles around the SCOBY are all completely normal. During the 7-10 day period, taste the kombucha and when the flavor is what you like (a good balance of sweet and sour!) move on to the next step. 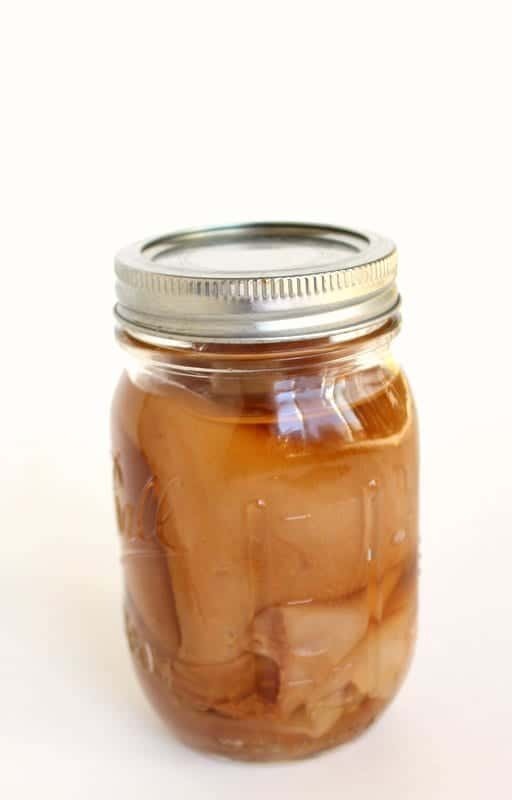 Prepare a new batch of sweet tea for your next batch of kombucha, or you can store your SCOBY in a jar with 2 cups of fermented tea in a ball jar on the counter. Pour the fermented kombucha into 5 16oz glass bottles and the one plastic bottle using the funnel and leaving a little space at the top. Add any flavorings you want (100% juice, fresh herbs, fresh fruit) to each bottle and seal with a lid or cap. Store the kombucha in the individual bottles for 1-3 days out of direct sunlight allowing it to carbonate and become naturally fizzy. Each day, check the firmness of the plastic bottle. 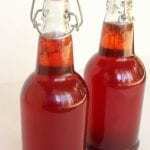 Once it is firm to the touch, place the bottles of kombucha in the fridge to stop the fermentation process. 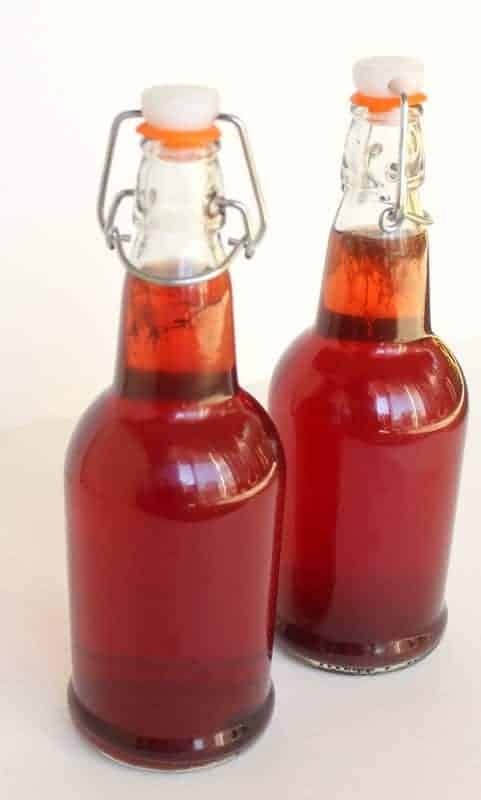 Consumer your kombucha within a month. Make a new batch of kombucha! *Make sure the SCOBY and starter tea do not touch metal surfaces in stock pots, pans, spoons, etc. *If you try the kombucha and it isn’t carbonated enough, just set it back out on the counter for a couple of days (even after being in the fridge) and it will carbonate more. Have you ever tried kombucha? Did you like it the first time you tried it? I make my own as well. While I prefer it plain, I love to experiment with different flavors. I recently did a citrus and rosemary blend and it’s so good! Have fun! Citrus rosemary sounds so wonderful!! I just flavored a batch yesterday and put some fresh ginger in there. I think it’s going to be spicy and delish! I just love kombucha! Making it is a great idea because buying it just isn’t economical! Thanks for the tutorial! I find that the flavor and carbonation is way better when I leave the individual bottles out for a week or so. Just popped a batch of grape booch in the fridge this morning and can’t wait to give it a taste! Great tip for leaving the bottles out even longer!! I love when the drink is super fizzy. How do you flavor yours grape!? Sounds tasty! OMG I HATED kombucha when I first tried it, but now I’m obsessed! But it is so expensive so I love this…I definitely need to try this recipe out! Thanks for sharing Tara! That’s how I feel, Chelsey! I’m like…did my tastebuds change or did kombucha change? You will be shocked at how easy it is to make. I went with my sister when she purchased her first “kombucha mother” from craigslist in Chicago. I thought it was the weirdest thing ever in the history of the universe. LOL! I felt like I was at some strange drug deal! 😉 She explained it all to me though! HA! That is such a funny kombucha story!